You guys!! We're getting there! 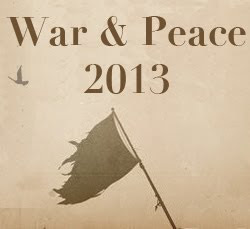 Only three more months of reading War & Peace! Though, according to Goodreads we are only 73% of the way through I feel like we should be farther. I mostly enjoyed this section minus the little bits where Tolstoy explained How History Works to us. "Helene, on the contrary, like a truly great person who can do whatever she likes, at once placed herself in the position of being right, in which she sincerely believed, and all the others in the position of being wrong." "Bilibin...one of those friends that brilliant women always have, male friends who can never pass into the category of lovers." It's so funny because it's like just a little detail in this fully imagined story but such a common trope in stories! Anyway, I guess I should feel sorry for Pierre, but mostly I just found Helene's story amusing. "But Pierre did not know that; entirely absorbed by what lay before him,, he suffered, as people suffer who stubbornly undertake something impossible--not because of its difficulty, but because of its unsuitability to their nature; he suffered from fear that he would weaken at the decisive moment and, as a result, would lose respect for himself." The whole idea of Pierre killing Napoleon seemed really out of left field to me, but it's not like I can say I'm fully tracking with this book, I don't know. Finally, Natasha is a master packer! The scene where Andrei is hoping to see her again and there she is! Is straight out of a movie! Lol, finally I had a moment where I wondered if I was just super unknowledgeable (I actually sort of am when it comes to literature). Now that I've read Tolstoy, I've been starting to think about what author to tackle next and Faulkner was coming up on my radar. I've only ever read a short story in high school that I didn't like. (I still haven't decided, perhaps I should try Virginia Woolf again tbh! But for anyone interested, Melissa Marr had a rundown on Faulkner's books, lol) One of my friends mentioned that Faulkner loved War and Peace which I was just like...yeah literary greats liking other literary greats, whatever, but lol the line As I lay dying totally stuck out to me in this month's reading! Thankfully, though, upon a little investigation, it's actually taken from the literary great of all greats, The Odyssey. It was just one of those weird moments where I was like wow am I just really clueless? Yes but not in the way I thought I was. War and Peace so far is such an odd book to me. Like, I really enjoy Tolstoy's ability to capture human nature and behavior, but on the other hand I do feel like I have no historical context for what's going on. It's all just a bit strange! 1) How do you feel about Andrei and Natasha's reunion? 2) Any thoughts on Pierre or Queen Helene? 3) Any thoughts on the history/war stuff in general?